Featured amenities include a 24-hour business center, express check-out, and complimentary newspapers in the lobby. Planning an event in West Hollywood? This hotel features 0 square feet (0 square meters) of event facilities. Self parking (subject to charges) is available onsite. With a stay at Grafton On Sunset, you'll be centrally located in West Hollywood, steps from Sunset Strip and 14 minutes by foot from Whiskey a Go Go. This 4-star hotel is 1 mi (1.6 km) from Melrose Avenue and 2.3 mi (3.6 km) from TCL Chinese Theatre. When you stay at The Jeremy Hotel West Hollywood in West Hollywood, you'll be on the Strip, just steps from Sunset Strip and 13 minutes by foot from Whiskey a Go Go. This 5-star hotel is 0.9 mi (1.5 km) from Melrose Avenue and 2.4 mi (3.8 km) from TCL Chinese Theatre. Enjoy recreation amenities such as bicycles to rent or take in the view from a terrace. Additional amenities at this aparthotel include complimentary wireless Internet access, concierge services, and babysitting/childcare (surcharge). With a stay at Sunset Marquis, you'll be centrally located in West Hollywood, steps from Sunset Strip and 12 minutes by foot from Whiskey a Go Go. 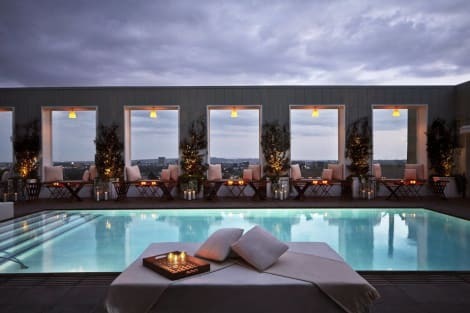 This 4.5-star hotel is 0.8 mi (1.3 km) from Melrose Avenue and 2.5 mi (4.1 km) from The Grove.